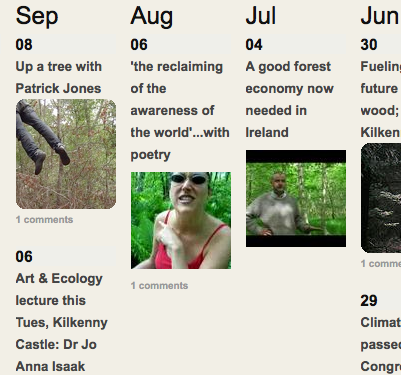 This is my 100th post on my art & ecology notebook site – amazing! I’m as shocked as probably you are and its made me realise that I have created quite an archive of the different means where arts and ecology intersect. What started out in 2008 as a small personal notebook has grown – it initially was a place to put inspiring art & ecology projects and resources that I came across in one place and also a means to house the beginnings of my own long term art & ecology project. From a small rural location the site has allowed me to gather and make visible projects that often fall outside the mainstream agendas of many galleries and it has allowed my own practice to travel to many unexpected destinations. 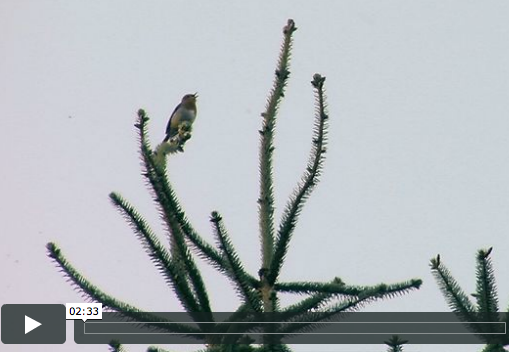 For newer readers my artistic work is about creating small audiovisual works that touch on the small forest that surrounds our house that we are transforming from a monoculture conifer plantation into a permanent mixed species forest. Mostly my own work is about how we engage with ‘nature’ in general and its led me to pursue the idea of whether audiovisual video works can be used in a more ecocentric way, if that is possible (if you are interested my research on this topic can be found here). My art & ecology site been quite an odd jumble of things and early posts were a bit random, but my readership has steadily grown even though my posts can appear a bit infrequently. Thank you for all the comments along the way too – you have no idea how this small site has enabled my work to develop and connect with others! disciplines for instance that I have written about; from film to dance, to music to policy papers on culture and sustainability. You are more than welcome to share any of these posts along. site HerCircleEzine.com – an online site that for the last 6 years has been dedicated to women’s socially engaged practice. I was surprised and delighted – to tell the truth the research paper had been turned down originally for an academic journal (not that I was too surprised about this as it was my first attempt) but of course, a paper on social media, should be circulating on social media not stuck in some academic journal. 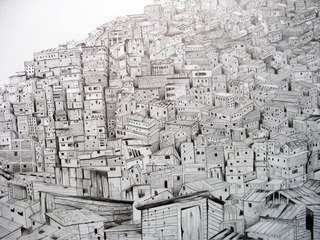 I’ve created a resource page of the many various art & ecology networks too – please feel free to tell me about other networks not listed. There’s more too, I’ve also been asked to write a regular column on the HerCircleEzine site about art & ecology and my research practice, starting in November which I must say is a bit daunting as if you examine the site you’ll see the articles written are of a very high standard. 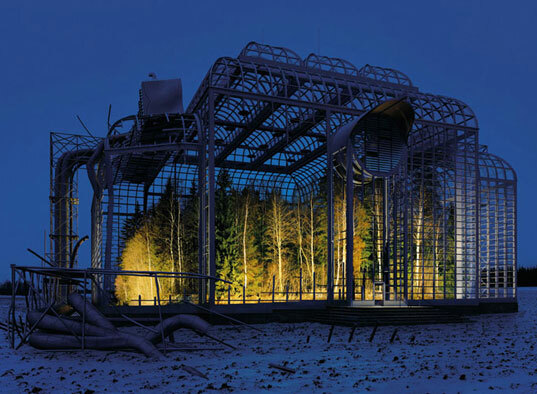 You might have also noticed the blue forest image above – the Museum of Nature created by Finnish photographer Ilkka Halso. I found this image intriguing; its from a larger body of works by Ilkka called Restoration (2004). While I don’t like the idea of putting a forest in a cage I could identify with this artist’s interest with forests. I have also come across a number of artists who describe their art & ecology works as ‘restoration’ environmental projects. It’s not a term I use for my own forest project; while restoration of sites is obviously important I think much more needs to be addressed. Undoubtedly we can learn much from restoring sites/habitats, but for me, I think there is something more interesting in transformation; transforming the ideas and practices of how we relate to nature (a tricky area when one begins to examine it though) and hence, transforming how we behave on this one finite earth. You might be wondering why I’ve added this paragraph at the end of this post – I was saving the best for last . My tiny forest, nick-named ‘Hollywood’ has been getting some attention. 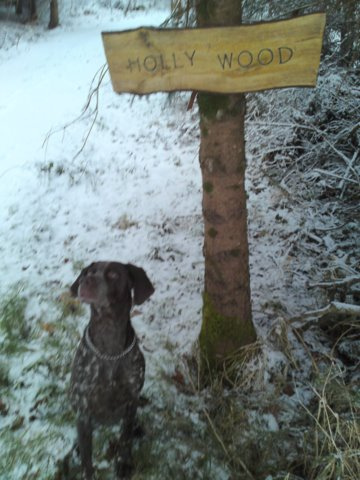 ‘Hollywood’ is now listed on the new Irish database for forests that are being managed in a permanent way – its the smallest plantation undergoing ‘transformation’ to become a forest, in Ireland. We manage the forest following close-to-nature principles ( a low impact management system that follows nature’s own dynamics). As it is an ecological type of forest management it means that the forest is sustainable not only for our use (we get firewood, birdsong, oxygen, sanity etc from it) but as it will never be clear-felled; the overall biodiversity, soil fertility and carbon-sink values on the site will only ever increase. 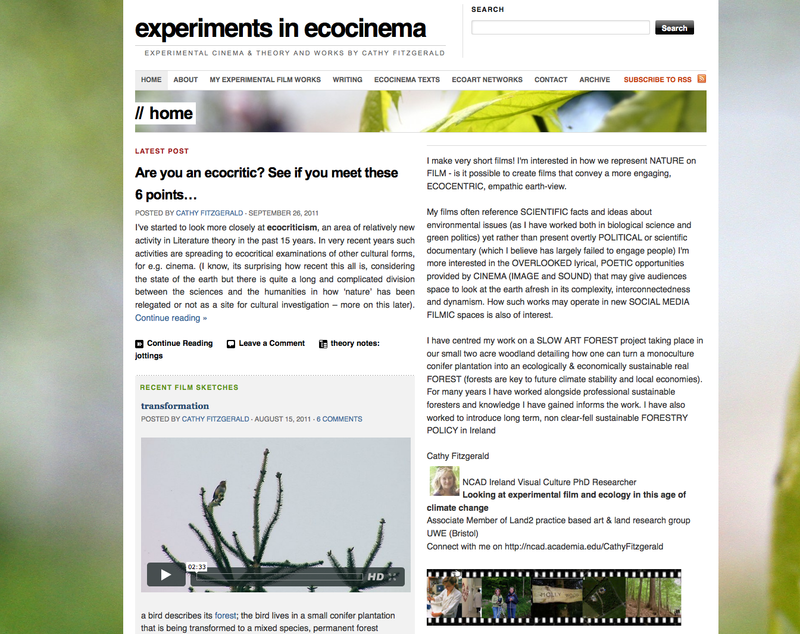 Funny, how this writing about transformation has slipped into this post, as I often have a lot of difficulty in talking about my creative work – in fact, I think its much better presented by the forest itself (click on the image below if you can’t see the film). If you have any comments, do write in! 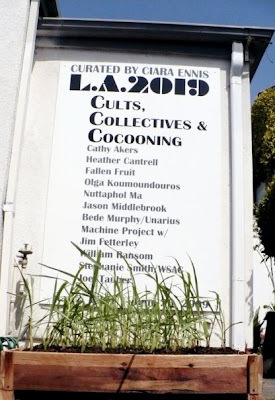 Ciara Ennis, Director/Curator of Pitzer Art Galleries in Pomona, has organized an oddly cool and thoughtful grouping of artists at 18th Street Complex in Santa Monica entitled 2019: CULTS, COLLECTIVES & COCOONING. The show includes some ecoartspace favorites like Fallen Fruit and Machine Project, Joel Tauber (in ecologic at Cypress 2009), as well as Jason Middlebrook who east coast ecoartspace curator Amy Lipton has worked with the last couple years on various projects. What I like about this concept most is the imagined and practical applications that inspire a conversation about what kind of future do we want to live in. Do we want to live in fear, or in awe of the universe, and work together to solve very real problems creatively? This exhibition features objects, installations, photography, drawing and video works by emerging and established artists and explores three related themes: real and fictional intentional communities, the power of the collective versus the individual, and sustainable solutions for future living. Other artists include: Stephanie Smith/WSAC, Bede Murphy/Unarius, and Nattaphol Ma (artist fellow, 18th Street).